Batteries Direct sells the V-Tech VT-5871 Battery Upgrade manufactured by Energizer for only $12.99. That is the total cost. There are NO shipping or handling charges. Don't be tempted by those $5.95 offers. Those companies are probably selling used or refurbished batteries. And when you try to get ahold of them because your battery fails - well... good luck! Conversly - Batteries Direct backs up the VTech VT-5871 Battery sale with the industries only One Year Power Performance Pledge™ No-Hassle Warranty , Money Back Guarantee and Toll Free Customer Support. We hope you will choose to buy all your replacement V-Tech Batteries from Batteries Direct. Batteries Direct is a service oriented company that has been online since 1996 and we want to make you a lifetime customer. The V-Tech VT5871 Cordless Phone is one of the most popular portable telephones sold by V-Tech. We carry a premium battery for the VT5871 cordless phones. You can expect a long life and a reliable performance from this nickel-Metal Hydride battery. Designed with the finest components available, the V-Tech VT-5871 Cordless Phone Battery is sure to exceed all your expectations. What are the technical specifications of the VTECH VT5871 battery pack? The new V-Tech VT-5871 Battery is capable of running your cordless phone for long uninterrupted hours with a power capacity of 700 mAh and an output voltage of 3.6 volts. The dimensions of this battery are 1.75 x 1.25 x 0.44 (L X W X H) inches. This high quality NiCad battery delivers 14.3% more power than the original battery. If you are planning to upgrade or replace your existing cordless phone battery, then the VTech VT-5871 Battery from Batteries Direct is the right choice. What is a Nickel-Metal Hydride battery and how can it benefit my cordless phone? 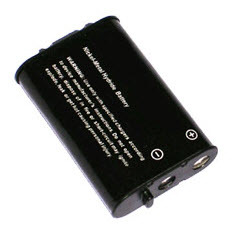 The NiMH battery is a highly popular rechargeable battery type used for cordless phones. The NiMH battery performs excellent under tough working conditions when compared to other battery chemistries. Ni-MH batteries can supply high surge currents with a low internal resistance. They are ideal for your cordless phones and do not suffer from "memory effect" that inhibits older nicd battery packs. If most cordless phone batteries are rechargeable, then why do they ever need to be replaced? It is true that most cordless phone batteries are rechargeable. A tiny portion of the Nickel Metal Hydride chemical components of the Vt-5871 battery are used up every time the battery charges or discharges. Over a period of time, the chemicals are completely exhausted and your battery must be replaced. One of the first symptoms that your battery is begining to give up is a low beep tone in the phone. Also you will have noticed that it does not hold a charge as long. What are the additional replacement part numbers or cross references for the V-Tech 5871 Battery? ATT 102, ATT 103, RADIO SHACK 23-966, V-TECH 80-0429-00-00, V-TECH 80-5808-00-00, GE 86413, ATT 89-0429-00-00, V-TECH 89-1324-00-00, PANASONIC HHR-P103, PANASONIC HHR-P103A, PANASONIC N4HHGMB00001, GE TL96413, PANASONIC TYPE 25, PANASONIC WN4HHGMB00001.